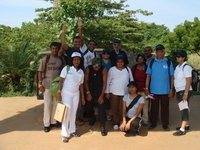 WCO Sri Lanka participated in Staff Retreat Program which was conducted in Sigiriya from 16th to 18th October 2009. Promotion of “recycling mentality among the staff and develop proper solid waste management” was one among the retreat action points. A working committee was also identified. The objective of the initiation was to promote proper solid waste management in WCO and to promote recycling mentality in WCO staff. World Health Organization Country Office for Sri Lanka participated in Staff Retreat Program named “Wild Drift Team Challenge” which was conducted in Sigiriya from 16th to 18th October 2009. This was a long felt need after a period of nearly four years and conducted as a joint venture with “Wild Drift” which is management training Company that carries out their programmes in a different way in the wilderness! Prevention of non communicable diseases and promotion of healthy life styles was one of the action point identified at the WHO staff retreat in Sigiriya. WCO staff worked on the action point and tried to develop the office as a workplace that encourages healthy habits which reduces the risk of heart disease and stroke one of the world’s leading cause of death. “Saying No to tobacco, eating a healthy diet and being physically active” are important steps towards greater productivity and longer life. 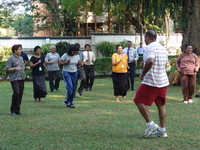 In view of that WCO started aerobics exercise sessions Fridays at 3.00-3.45 pm under the guidance of a trainer since 23rd October.